wrote Zen and the Art of Motorcycle Maintenance, died Monday at age 88. Robert M. Pirsig, who inspired generations to road trip across America with his "novelistic autobigraphy," Zen and the Art of Motorcycle Maintenance, died Monday, April 24th, 2017, at the age of 88. His publisher William Morrow & Company said in a statement that Pirsig died at his home in South Berwick, Maine, "after a period of failing health." Pirsig wrote just two books: Zen (subtitled "An Inquiry Into Values") and Lila: An Inquiry into Morals. Author Robert Pirsig works on a motorcycle in 1975. Zen was published in 1974, after being rejected by 121 publishing houses. "The book is brilliant beyond belief," wrote Morrow editor James Landis before publication. "It is probably a work of genius and will, I'll wager, attain classic status." Christopher Lehmann-Haupt reviewed Zen for The New York Times in 1974. "[H]owever impressive are the seductive powers with which Mr. Pirsig engages us in his motorcycle trip, they are nothing compared to the skill with which he interests us in his philosophic trip," he wrote. 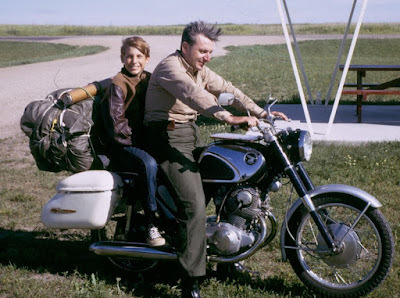 "Mr. Pirsig may sometimes appear to be a greener‐America proselytizer, with his beard and his motorcycle tripping and his talk about learning to love technology. But when he comes to grips with the hard philosophical conundrums raised by the 1960's, he can be electrifying." Zen and the Art of Motorcycle Maintenance was one of just two books that Pirsig wrote. It has endured as a work of popular philosophy. Pirsig also helped found the Minnesota Zen Meditation Center, then lived reclusively and worked on Lila for 17 years before its publication in 1991. "A skilled mechanic, he performed repairs in his home workshop," writes the publisher. "He taught himself navigation in the days before GPS, and twice crossed the Atlantic in his small sailboat, Aretê."